There Are Mistranslations in the Bible and the Word Elohim Can Be Used as a Plural. For those of you who have followed the debate on the internet you may know about the personal attacks I have withstood from Michael S. Heiser, in my attempt to honestly debate him regarding the writings and thesis of Zecharia Sitchin. I always choose my words carefully and have never used the word “wrong” when applying it to Mr. Heiser and I have never personally insulted him or his position. The word “wrong” has emotional charge behind it so I try to use “correct/incorrect” to apply to details or facts. I prefer to debate the evidence and the issues and not have a discussion become personal. The purpose, for me, is to increase my understanding of a subject and clarify misunderstandings. My goal is always to add to the body of knowledge and understanding of a complex issue for the readers and myself. As you will see, Mr. Heiser’s goal is not to add knowledge and understanding to these issues. His goal, from the beginning, when he came on the web page and speaking scene, was to tear down the work of an established author. He had no name recognition to stand on so he used Sitchin’s good name to get attention for himself so he could sell his own book, appear on the radio and get speaking engagements. Mr. Heiser does not think he is a debunker and I will not declare that he is. My purpose is, for the reader, to point out that his tactics and behavioral patterns fit the mold and style of a debunker which includes using personal attacks and ridicule. You can make the decision on your own once you see both sides of the issue. Hopefully, you will reach your own conclusions about his motives. Debunker trick #1, when having no reputation of your own, attempt to destroy the work of an established individual, in the process creating a name for yourself. In fact, the method involves using the name of the person you are attempting to destroy as the springboard for yourself. His first web page that I read was full of insults and uncalled for statements. You would think that a man who claims he has a respected background and career would not want to use someone else’s name for his own gain. Wouldn’t he want to be recognized for his own individual achievements? This maneuver is a “shifter” strategy made famous in the book, “Atlas Shrugged,” by Ayn Rand. This procedure is used to take away from someone the thing you want the most for yourself, thereby “shifting” it away from them and to you. In this case, Heiser wants to take away Sitchin’s fame and respect as an author, researcher and speaker. Even at this point, he still wants to debate Sitchin. For what purpose? If it were to add to everyone’s knowledge and understanding there would be no need for personal attacks against Sitchin or me. Sitchin does not have a computer, does not browse the Internet and, therefore, has never seen any of Heiser’s material nor heard him speak. Why would he agree to go on the radio and be attacked? Why would Sitchin help Heiser increase his name recognition? Sitchin is just too busy writing new books and arranging seminars. You can tell from Heiser’s writing style that he is very confrontational — he uses debunker tactics. His purpose for wanting to debate Sitchin is to employ the attack and ridicule process. This is completely inconsistent with a person that wants to raise up all of society by their knowledge. I don’t think there will be a debate with Sitchin, but I still have a few words to say…. Zecharia Sitchin’s thesis is simple to understand and has much evidence and weight behind it. It is that the Sumerian people, (later on the Akkadian, Assyrian and Babylonians) carved on clay tablets, (3/4 of a million texts, most of the tablets are contracts for goods & services and administrative tablets), that tell a story that is both familiar and fantastic. The tablets, which have never changed from the date of creating them, have been found in digs all over the Middle East. The oldest stories of the Bible including the creation of Earth, the creation of man, the flood & destruction of mankind, the Tower of Babel all are contained in these tablets. 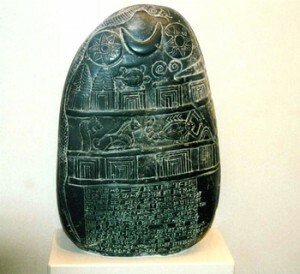 The tablets talk of multiple gods with different names that helped the people learn about harvesting, shepherding, astronomy, the calendar, irrigation, etc. Sitchin has shown that the level of understanding and advanced thinking could not have been by accident and chance. The Sumerian kings and priests never claimed credit for this knowledge; the tablets always attributed the information to their gods, called by them the Anunnaki. Meaning “those who from heaven to Earth came.” Many of the tablets discuss the eating and dietary habits of these gods that inhabited the temples, who were cared for by the humans with reverence. This is no fantasy, the tablets contain bills of sale for the materials delivered to the temples, and foods that were consumed and paid for. Some of the gods would not eat meat before Mid-day, or if they were served in anything but gold bowls or gold cups would throw it back to the humans. Many authors and scholars have shown that the Bible picked up many of these ancient stories and influences and wrote them down the best they could at the time, not having direct access to the tablets, but the stories being holy and repeated publicly at festivals. But later on the mistranslations appeared because of the different languages, influences of individual authors, scribes and translators that placed their own stamp and philosophy on them. Sitchin has shown certain words have an older origin than the Hebrew language and it is a known fact that Hebrew borrows words from Aramaic, Canaanite, Akkadian, etc. These words are clues to cultures which preceded the Hebrews. Sitchin never stated that the grammar would be perfect to match the plurality of the word gods/Elohim. He stated that certain words contain evidence and history with them that show the older influence from those previous cultures. Is it possible that every translation is fully correct? No, it is not possible that 100% of every translation is fully correct. And Mr. Heiser agrees! In his last email directly to me, he stated that of course there are mistranslations in the Bible and listed a couple for me (Gen 35:7 – 13, Psalms 82:1). He points out that these passages mix up plural and singular forms of the word “gods/Elohim” and singular/plural grammar. He thereby agrees with Sitchin’s thesis that the old translations have mistakes, made from editing, scribes or translators, either purposeful or by accident. He simply doesn’t agree that every translation is incorrect, but Sitchin does not say that every translation is incorrect. But like the method of a debunker and using debunking trick #2, Mr. Heiser doesn’t simply state his point of view with his proof and evidence instead his method of debate is to personally attack and ridicule before he presents his evidence. This is supposed to make the person receiving the abuse get off balance and draw(s) away from the debate topic, which is an intentional distraction. So he comes out swinging with insults and personally ridiculing the other position and viewpoint and anybody that believes the opposite of him. Yet, he agrees in many situations there are mistakes of grammar with mistranslations, and he even points out there is mixing up of plural and singular forms of speech in the same sentence. This inconsistency is also the hallmark of a debunking position. Debunking trick #3, is to argue certain points in some situations, yet agree with certain points in other similar situations. And the points of disagreement are not important enough to cancel out the rest of the evidence. This inconsistency must be pointed out. Then why attack a respected author and claim he is wrong as a blanket generalization when you in fact agree with him in some of the situations. Well that takes us back to trick #1, to get name recognition for yourself when you are unknown. How else will you be invited to do radio shows and get on the lecture circuit? What Mr. Sitchin has identified in his writings are some of the mistranslated words that appear, and when taking into account the historical influence from the previous cultures a new meaning and understanding arises. This means that the Bible indeed has a bibliography and there was civilization on Earth for at least 2,000 – 3,000 years before the time of Abraham, some say much longer. This way of thinking adds new meaning and understanding to our lives and affects us in profound ways that is different for every individual. Over 8 million copies of Sitchin’s books have been sold in over 14 languages, and every time a new country gets his books, they appear on the bestseller list. Why? Simply because they expand our thinking about humanity and our origins. They are brainteasers that stimulate something that is inside of us to want to learn more and have more understanding. Most of us realize that what we have been told from official sources has something missing. There is simply much more to the story of humanity than what the same old translations tell us. The age of the Bible and certain cultures: (Dates come from “Mesopotamia” by Julian Reade, a publication of the British Museum and “Atlas of the Bible,” edited by James Pritchard, published Harper Collins). Abram (Abraham later on) came from the land of Sumer (Shinar in the Bible), from the capital city known as Ur (Ur Kasdim in the Bible, Gen 11:31). His father and grandfather were long lived Sumerians that lived in the capital city of Ur (around 2,025 to 2,075 BCE). Abraham’s parents worshipped the gods of Sumer and he grew up with that culture. It says in Joshua 24:2, “Your forefathers, Terah the father of Abraham and the father of Nahor, always dwelt beyond the (Euphrates) river and they served gods (Elohim) of others.” This also means that Abram would have heard the Sumerian mythology repeated every year during festivals, if he attended with his father & grandfather, until he left the land and went to Haran. The Israelites left Egypt around (1,250 – 1,350 BCE) depends on who you think was the pharaoh at the time and the dating of them. How could it be that the biggest holiday is not even celebrated during the time when the first holy temple is still in existence? What other parts of the Bible were forgotten during this time? During the lifetime of the prophet Jeremiah, during the reign of Jehoiakim the son of the previous King Josiah, (about 598 – 597 BCE), parts of the Bible were re-written by Jeremiah. Apparently they had lost much of it again because Jeremiah delivered it to the elders and advisors of the king, and when the elders read it, they were amazed (Jeremiah, Chap 36). But the king got mad when he heard Jeremiah’s prophecies of destruction and threw the scroll into the fire. So Jeremiah re-writes the scrolls once again from the words of Yahweh. This could also be called channeling. Here we have an example of the Bible actually telling us that it is being written in real time, as opposed to saying it is an old document. How many times has the Bible been lost and had to be re-written? How many foreign influences appeared to creep into the re-written Bible? When the Jews came back to Israel from the exile in Babylon (about 520 BCE), they had picked up the Babylonian names of the months of the year. They still use those names today even though the older Bible from the desert with Moses has numbered months, this all changed in a time span of 70 – 72 years of exile. The original names of the months are listed with the holidays that went with them in Numbers 28:16-39, an example is the first month, or the seventh month, that is how Yahweh and Moses labeled the months of the calendar. Here are examples of just three names of the 12 currently being used. Nisan from Nisanu, Tishrei from Tashritu, and my favorite Tammuz from Dumuzi, (Dumuzi is the actual name of a Sumerian god. Tammuz is the Semitic pronunciation. I am not sure if the Rabbis know they are using the name of an ancient false god for one of their month’s names). So when the final compilation of the Bible appeared during the years after returning from the Babylonian exile (around 520 BCE). The biblical authors incorporated their philosophy of one deity, Yahweh, into the copies of the scrolls. Whatever attributes a previous god may have had, was retained and given to Yahweh on paper. If the story was holy and the deeds were attributed to Anu, Enki, Enlil, Inanna or Marduk it became the property of the Elohim or Yahweh. Probably Elohim was a clue to uncover those stories that showed an earlier influence from Mesopotamia. Why not just give one name to all the other gods mentioned and save much time? Remember the Bible is trying to prove there is only one god, which is the point of the document. So we can accomplish this by putting all individual names into one general term, plural of course, and for the priests with the secret knowledge that know for themselves, we just incorporated the great stories the public knows and made them specific to our culture and our congregation. Who would know about the older tablets, who would know we borrowed? This plan did work until the late 1880’s, and early 1900’s when archeologists started to finally dig out the texts in their original tablet form and the scholars translated them. They were astonished to find so much of the source material for the Bible. This plan worked for more than 2,000 years, most people thought the biblical stories were original to the Bible. Even now people are astonished when I tell them there are stories of semi human/semi divine characters and stories of resurrection from 2000 – 3000 years before the time of Jesus and even Abraham. The modern version of the Bible was probably read by Ezra (about 464 BCE) at the inauguration of the Second holy temple in Jerusalem. Obviously scholars disagree with the exact dating. After getting through the personal attacks against me, Mr. Heiser gets down to showing some examples of Biblical writing with graphics in Hebrew. He states with regards to “Elohim,” there are hundreds of uses in singular and hundreds of uses in plural and many sentences that mix it up in the same sentence. I want to thank Mr. Heiser here for showing these inconsistencies. This gives weight to my argument and Sitchin’s thesis that the word “Elohim” is a loan word from a previous culture, which is why they had so much trouble incorporating it into their language with proper rules of grammar. We don’t dispute that “Elohim” is used both as a plural and a singular. What we see is that the word Elohim is a clue to the antiquity of the Bible, showing a much older influence. 1. He has a fallacy of incorrect analogy. He compares the word Elohim to Sheep, Fish and Deer showing how the grammar can change the meaning to either singular or plural. The reason this is a fallacy of incorrect analogy is that we use the same word in English for the singular and the plural. Sheep, Fish and Deer do not have singular roots in them. Heiser does agree with me that the word “Elohim” contains the root singular form of god that is pronounced “Eloah.” If you wanted to say god says (singular), you could say it as “Eloah” says and it would be correct. The reason the Hebrews use the word “Elohim” is that it is a holy word to them and they must not change that word that to a believer in one god must and can only mean “God.” But was the word “Elohim” meant to be singular to represent a single deity by the original culture that created the usage, or was it borrowed and used later on by scribes with monotheistic philosophies? Wasn’t the purpose of using so many different god names in the Bible to show differences in those characters? 2. Mr. Heiser’s, use of translations from the Dead Sea Scrolls is irrelevant, because they are younger than the canonized Bible and therefore can’t be used for this debate. Many Dead Sea Scroll translations are in dispute anyway, and the group that controlled the scrolls for so many years has gotten into trouble, they have even mistranslated Nephilim as watchers. It was the Igigi who could be called watchers. Mr. Heiser’s use of translations from the Book of Enoch for any translation is irrelevant because, first it is not part of the canonized Bible, and second it is younger than the canonized Bible. I still have not seen one original Hebrew version of this document that can be dated back to BCE era. The book is supposed to be very old, but there is no verification as to the modern version that is currently available. There is no chain of evidence to make the case that the version we have is actually older than the canonized Bible. I must tell the public that Heiser’s use of translations from text that are younger than the Bible show that he does not understand what this debate is about. It is not about contemporary mistranslations that have been made by modern translators. This debate is about what older influences were placed into the original Bible. By the way we just saw debunker trick #4, which is to reverse the process so that you can use proof of translations from younger documents to prove translating mistakes in older documents. This can’t be done because of the arrow of time moving forward. Only older documents than the Bible are relevant to be an influence, and younger mistranslations that continue the mistakes are not evidence. Can we trace those original Sumerian sources? 3. Heiser’s biggest fallacy and showing a lack of understanding of the history of languages is his statement, “Sumerian is not connected to any other language.” I am really surprised that he would make this statement. Most similarities are in the Semitic area, which is Heiser’s area of study. The Sumerian influence is still felt today in language and their original stories all over the Bible. With all those tablets that I spoke about before, many different copies of them were found with the same stories. The root to those stories is the Sumerian culture, but after the culture dies off the stories moved to the Akkadians, although they still wrote all the religious documents in the Sumerian language for hundreds of years after Sumerian was not a publicly spoken language. Later on with King Gudea, there was a resurgence of the Sumerian language (2,122 – 2,141 BCE). Then the stories moved to the Assyrians, Babylonians, Hittites, Canaanites, Hebrews, etc. Archaeologists found translation tablets that had dictionaries carved on them, they said this word in Sumerian is this word in Akkadian, this word in Akkadian is this word in Assyrian, etc. Many tablets were broken in pieces and fragmented so it took many years to connect the pieces from the museums around the world and put the texts together. But some texts were found in libraries of clay tablets, where they found a shelf full of intact texts, with the catalog list at the front of the shelf. The index list told archaeologists what tablets were missing from the shelf. Obviously the archeologists were amazed to dig up complete libraries of carved clay tablets. Mother – Ama in Sumerian, Ima in Hebrew. Father – Ab-ba, Ad-da in Sumerian, Aba in Hebrew. Mountain, mountain-range – Kur, Hur-sag in Sumerian. Har is mountain in Hebrew. Kur could also mean land. Alla, (Allah) the name of god in Arabic was also the name of a Sumerian goddess of the netherworld. 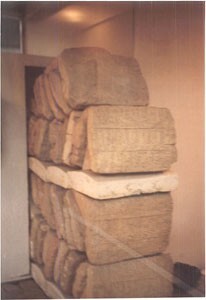 In Akkadian Allatu. Earth – Ki in Sumerian, also known as Gi or Qi. Modern usage Gaia for the mother Earth. 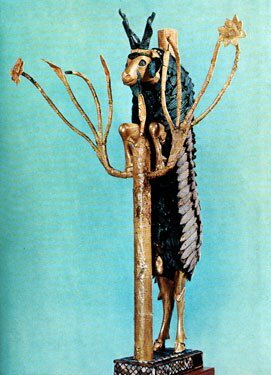 Great – Gal in Sumerian, in Hebrew Gadol is great or large; it has the same first and last sound. Three letter root is GAL, GDL. The Sumerian people were sometimes called Lu-Lu Amelu, which means mixed up person (being). Because their mythology said we were created from a mixture of ingredients and themselves. And in English we call someone Lu-Lu if they are crazy or mixed up. Adamu and Adapa are Sumerian names and characters, the original form of the name Adam from the Bible. Adam is always translated as “Man” in English. In Hebrew the word Adama can mean earth (dust of the ground) and Adom is red (like blood) and the word Dam means blood. Do you see how the root name of Adam is closely linked to other words? These double meanings will be important later on. Dumuzi – Sumerian god, used for name of Hebrew month as Tammuz. Crying for Tammuz is mentioned in Bible, Ezekiel 8:12 (about the same time as the Babylonian exile). They were not crying for the name of a month. They were crying in remembrance of Dumuzi the husband of Inanna who was killed and not able to be revived. 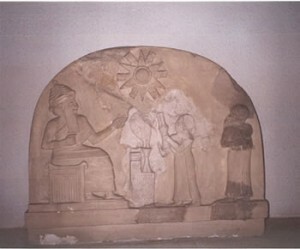 The Sumerian god Utu (meaning the [visible] sun) is the same as Shamash in Akkadian; he used the celestial symbol of the solar disk as his representation. The god name Shamash is the same as the Hebrew word for the sun, Shemesh. Imagine that, the word for sun is the same as the god who used the symbol of the sun. There are so many Sumerian influences, please read anything written by Samuel Noah Kramer, my favorite is, “History Begins at Sumer, 39 Firsts Recorded in Man’s History,” this will show you influences in the modern world that began in Sumer. The word Nephilim does not mean giants but they probably were giants in size, nobody disputes that. Most depictions from ancient Mesopotamia showed the Anunnaki gods to be much taller than humans. Mr. Heiser shows how in Numbers, 13:33, it calls the Nephilim the “children of Anak.” The word for giants in Hebrew today is Anak (singular) and Anakim (plural). According to the Signet “Hebrew/English Dictionary” by Dov Ben Abba, the word for giant can be “Anak” or “Anaki.” Well how do you think you spell Enki without any vowels? Let’s compare Anak and Enki without any vowels, they would look like this “ANK”, “ANK.” Lets compare the words Anaki and Enki without any vowels, they would look like this “ANK”, “ANK.” Let’s compare the words Anunnaki and Anak without any vowels, it would look like this “ANNK”, “ANK.” All of these comparisons are matches of similar sounding words. Yes the original source of the word for giant (Anak or Anaki) in Hebrew came from the Sumerian use of these words to describe their large gods. (In Hebrew, all these words could have the same 3-letter roots and could start with an Ayin, only the vowels and the pronunciation would be different. Mr. Heiser also tells you how the original Hebrew did not have vowels when originally written but were added hundreds to thousands of years later. He might say you would need a “yod” at the end of the word to have the “ee” sound, but a yod is just a single small line at the end of the word that could easily be left out by a scribe, and you can make the sound with the vowels, and imitate the “ee” sound by only using vowels.) 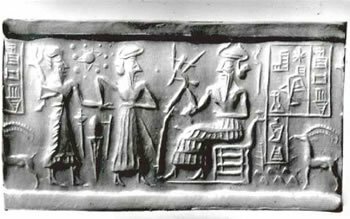 I think it is enough to show that the first written language that used the Anak, Anaki, Anunnaki root sound was Sumerian and that was the influence for the word giants in Hebrew. Imagine these names, Anu, Enki, Anunnaki, Enlil, which were repeated in religious documents year after year, for thousand of years. This is a huge influence on the people and their memories. In Numbers 13:33, we have “There we saw the Nephilim, [the children of Anak/Enki/Anunnaki], which come from the Nephilim, and we were in their site as grasshoppers.” Of course Mr. Heiser will bring up his objection with the incorrect grammar in certain places, and the mixing of plural and singular, but I am showing you the older influences, the previous cultures infusion into the monotheistic Bible. After Noah built an alter he offered sacrifices and “… Yahweh smelled the pleasing aroma…” (Genesis 8:21) There are a lot of gods that seem to like the smell of meat being cooked, including the Bible’s pure-energy, non-physical creator god who should not be interested in smells. Obviously this quote is taken from the older source, where the older gods are changed into Yahweh. After the flood these characters “fell” (naphal) back down to Earth and lived among the descendants of Noah and mankind. Until the time that Yahweh and the Israelites went to war against them. Famous giants (“Anakim” descendants of the Anunnaki/Enki) from the Bible are Og, King of Bashan (Deut 3:1), and Goliath the giant that Kind David defeated (Samuel 21:15-19). Another Sumerian influence is found here that Goliath’s name (Galyat in Hebrew) starts with the word “Gal” meaning great” in Sumerian. Today in the English language, we can use the word Goliath to denote something big and gigantic. Was it Yahweh or Enlil that changed the speech of man? In this case Enlil was changed into Yahweh. How is Moses connected to Sargon the Great, King of Akad? They were both placed in baskets and left to float in rivers, then found by noble people. We are finally near the end of this web page, and I really appreciate any of you that have read all the way to this point. I think I have shown with evidence that the Bible does in fact contain many influences from previous cultures. I think that when reading texts and seeing the pictorial evidence from the ancient Mesopotamian culture, a much greater story and history comes alive. This new information breaks through the monotheistic tendency of the Bible to discourage thinking and analysis of older cultures. The Bible treats all the old cultures as idol worshippers and non-believers, thereby discouraging research into them. But those same cultures created the stories that the Bible uses to prove there is only one god. And when those original stories were written many gods were mentioned in them. With all the administrate tablets found, we learn that the ancient gods lived among the people, were cared for by the people and in return were given knowledge to better their lives. The one difference between what Sitchin says (that I agree with) and what all the other historians, archeologists, linguists, translators, teachers, professor and scientists say is simple. Zecharia Sitchin says that all these stories and tablets relate to real actual events, they were written as history to show real things that happened. The characters were real and the descriptions of events that can’t be explained are also real. Perhaps the unexplained events are evidence of technology used on Earth, which may still be beyond our capabilities today. If the events were real, this means there were characters on Earth that were not born here, and their DNA is part of our DNA. It means that evolution happened on planet Earth and intervention also happened on planet Earth. The scientists are correct that evolution occurred and the theologians are correct that intervention occurred. Everybody else that does not think the stories are real, thinks the ancient people made everything up. They think all that they wrote was mythology. Well I have news for you, if you agree that it was all mythology, then the Bible that uses those stories is also copying mythology. You see to be consistent you either accept that the original sources of the Bible were real or they were fantasy. If you believe in the stories of the Bible then the older stories are also true. If you don’t believe in the Bible being true then you can say that the source material is also not true. You can’t have it both ways and still be internally consistent. One book borrows from the others. I want all of you to know this, regardless of what you believe, it does not mean you are crazy or foolish. If you believe in Sitchin’s hypothesis, then you are in the company of millions of people, that are normal, sane individuals. If you don’t believe in this hypothesis, that is also O.K., but don’t think down upon people that do believe it. And for the believers don’t think down upon the people that don’t. Don’t attack the other viewpoint, or ridicule the other position, the point of debate is to rise up, learn and educate everybody and not to exclude people. We are all entitled to our own beliefs and we are all absolutely free in our heads to think what we want. What I wish and hope for is that those beliefs are generated from your own research and your own view of the evidence. Please wait to make a decision until you see the evidence for yourselves. Visit the museums and read the original sources that authors use for their own books. Ultimately, it is the search for the answers that fulfills the human purpose for living. We may never know the whole story, but the search without attacking and destroying is what will keep our civilization going forward. But if the process is used to attack, ridicule and insult then society will continue to break down and go backwards. Mr. Heiser, your web page let me see outside of the box and I really appreciate the impetus it gave me to write all of this down. It was the inspiration and motive for my determination to finish this web page. I fear that if you respond you will attack, ridicule and put down what I have said here for the purpose of tearing down the knowledge and work of Zecharia Sitchin, by maintaining your continuous attack on him. From my knowledge you have been doing this at all possible speaking engagements. I hope I am “wrong” about your motives and what your response will be. I am hopeful that if you respond it will be with pure motives, with an intent to educate and lift up all of us with your knowledge and experience. You can reach people on your own merits, but when you use some of those debunking tricks it overshadows the scholarly aspect of your work. All of us are trying to gain more knowledge and understanding by any discussion we have and you can be part of it. Please act with noble intention and a sense of lifting all of us up to a greater understanding. I would like to thank Jason Martell, the Webmaster of Xfacts for continually presenting a wide range of Sitchin’s material. I consider him to be a friend and one of the best Internet programmers I know of. Please go to his site http://www.mars-earth.com/sitchin.htm for more Sitchin research, including interviews, slides, videos and much more. I began studying the Bible in Hebrew from the earliest age I can remember. Up until about the age of 17, I had been going to private Jewish School with an education program that included half English and half Hebrew studies. By 1997 I began to read and hear Zecharia Sitchin, and was lucky enough to go on several trips with him and other people that traveled with him. We traveled to England, Malta, Mexico and Italy together as a group. With other groups I traveled to Egypt and Israel. Of course I have read all of Sitchin’s books as well as many others in the same category. I have been Sitchin’s Webmaster from the beginning and have been helping him run his seminars the last few years. I am not related to Zecharia but we are close friends. I am recently married, my wife speaks Hebrew, and she is a Sitchinite. I met my mother in-law on two of the trips that I took with Zecharia, then she introduced me to her daughter. And as they say the rest is history. I currently work as a stockbroker in Los Angeles, which requires me to do a lot of research. Cylinder seal VA/243 from a museum in Germany, about 2,500 BCE. The upper left corner has a picture of a solar system. What it is in the center? Were you told in school that the ancients knew the sun was in the center? Count the orbiting planets around the sun. Include our moon and one extra planet and you will notice the number is correct for our solar system. There are 9 known planets all represented in this seal. When were Pluto and Neptune discovered? When you count the sun, moon and Nibiru as part of our solar system the number of objects is 12. I will give you an example of the problems the translators have had trying to convert the Hebrew into English. First please understand that the tradition of the scribes that originally came from Sumer was to change nothing of a religious scroll and simply hand copy it as is. Second there are many names in Hebrew for god used in the old testament and the Cabbalists (mystics) declare there are actually 72 names for god (the number 72 corresponds to the number of years it takes Earth to move one precessional degree, meaning 72 X 360 [degrees of a circle] will give you the number of years in one precessional cycle that total 25,920 years). This is the main problem of miscommunication and translating, because in English we have only a few words to use like God & Lord. So in every single English translation on Earth the word God or Lord is used for all the different names that exist in Hebrew. The word can be plural or singular, can be a title or an actual name, it may not even mean god but it is still translated that way. The example I will use comes from the story of Abram, Gen 15:7, God says to Abram, “I am Yahweh who brought you out of Ur-Kasdim…” Gen 17:1, “God appears to Abram,” in Hebrew, “Yahweh appears to Abram,” and says “I am El Shaddai” meaning I am god almighty, or I am god of the mountain. Then verse 3, it says “God spoke with him saying” in Hebrew “Elohim spoke with him saying.” Here in just a few verses in one small area are three different names in Hebrew but one god in English. Also this is two different quotes of God saying I am, with two different names, one Yahweh and one El Shaddai. Verse 9 it says “God says to Abraham,” In Hebrew “Elohim says to Abraham.” Elohim is used a couple more times, then it switches in Chapter 19:1, “Yahweh appears to him…”. Then it uses Yahweh a few more times. In chapter 18:31 it says “behold I desired to speak to my Lord,” In Hebrew lord is the word Adonai, which can also mean master, or a polite title to say to the king your master. It might not mean Lord at all, but it is used in English to mean Lord. There are examples of it being used less formally and not directed to god in the Bible. Type 1 data is verifiable, testable and repeatable evidence that everyone can examine for themselves. Science is based on this principle, what happens in an experiment in some laboratory will be able to be repeated in another laboratory. Mr. Sitchin’s evidence is type 1; all of you can read the tablets for yourselves and examine them for yourselves. You may not agree with the translations or the conclusions from the translations, but you can see the tablets, carvings and museum pieces for yourself. Mr. Heiser’s data is also Type 1, because all of us can read it for ourselves, although we may not agree with the conclusions. Type 2 data is multiple witness testimony, but with no evidence left to study. For example many people see a shooting star (meteorite) in the sky. They all agree what they saw but there is nothing left to view and no pieces to confirm it. If there was something left to examine it would become type 1 data. Type 3 data is a single witness testimony of some event and with no data left to study. Can you guess what area this covers? People who hear things in their heads and UFO abductees with no evidence left behind. If there is nothing left to study and there are no confirming witnesses then the event and the truth is only for you. This is the area of opinion only, this is not evidence. There are more types of data but this is enough for the purpose of our discussion today. How Many Intelligent Civilizations Exist in the Universe? Can you guess the answer to this one? I have found only one correct answer that makes sense to me. If you consider the length of time the Universe has been around (approx. 12 – 15 billion years), and the amount of galaxies (hundreds of billions) out there in the great vastness. If you consider how many stars are in each galaxy (billions to hundreds of billions) and how many planets that represents. If you consider that on Earth which is one speck of dust, we know of 200 -300 million species of animals, plants and insects, etc. If you consider that on Earth in every climate and every extreme area, life is found to thrive. there are an infinite amount of civilizations out there in the vast Universe. If we spent a lifetime cataloging them and could fly to them immediately to see them, we still would never be able to count all of them. The Earth is just one drop in a universe filled with water. We are not alone and have never been alone. Posted in ReligionTagged England, Zecharia Sitchin, Bible, Sitchin, Sumer, Michael Heiser, British Museum, Heiser, Hebrew Bible, Hebrew languagecommentLeave a Comment on Behold!